I had the opportunity to be back again in MADRI, although I was clueless for the perennial year-end dive. I was overtaken with other concerns and priorities. My dive buddy just pop-up to come over, because he wanted to have his last dive of the year with his favorite dive buddy. It was like an ambush though I have no qualms about being in the depths. It has always been my therapy for all the unrestlessness, especially with year-end hullabaloos. The distance of the airport and inconvenient flight skeds to CdeO wasn’t of help for a timely arrival in Mantangale, coming almost 11am the most that we could do was only for two dives instead of the usual three dives. Luckily, the weather was sunny like summer and I could only expect good viz for our descents. Speeding our way under the noon sun, our first descent was at the house reef (aka Banaug Shoal), it has been a favorite spot and again it didn’t disappoint us. My colds slowed my descent through the bouy line and thankful I made it. 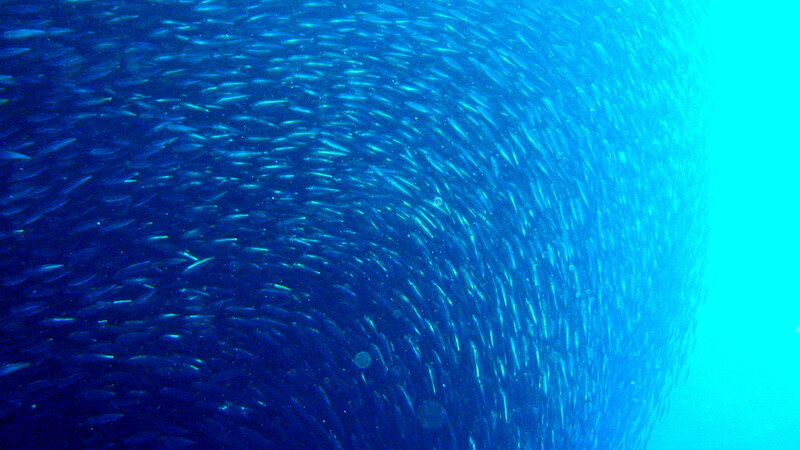 The unequalled diversity of marine life is simply engaging, swarm of damsels and chromis abound as we reached the hill. The snapper couple was also there, following us as if asking for food. 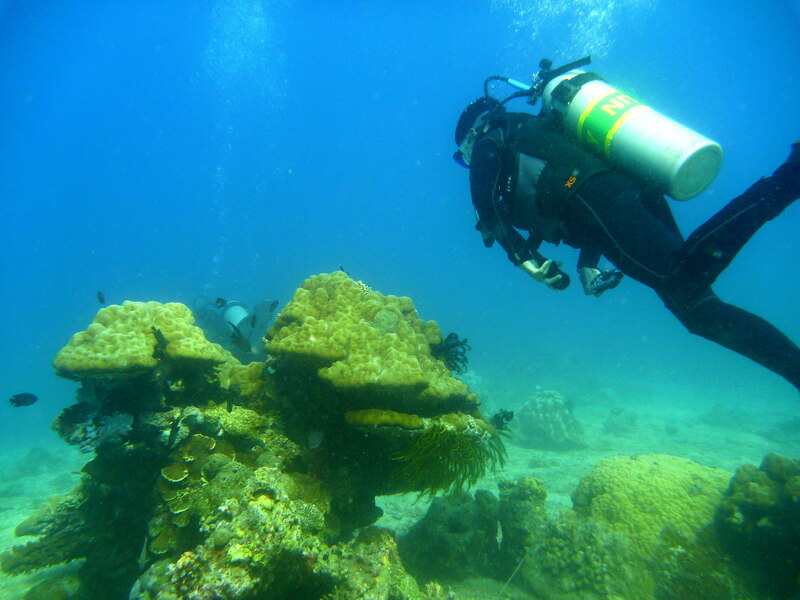 The black corals and a variety of hard and soft corals decorated the shoal. The tangles of soft corals blocking my way felt like I was in the grasslands finding my way out. 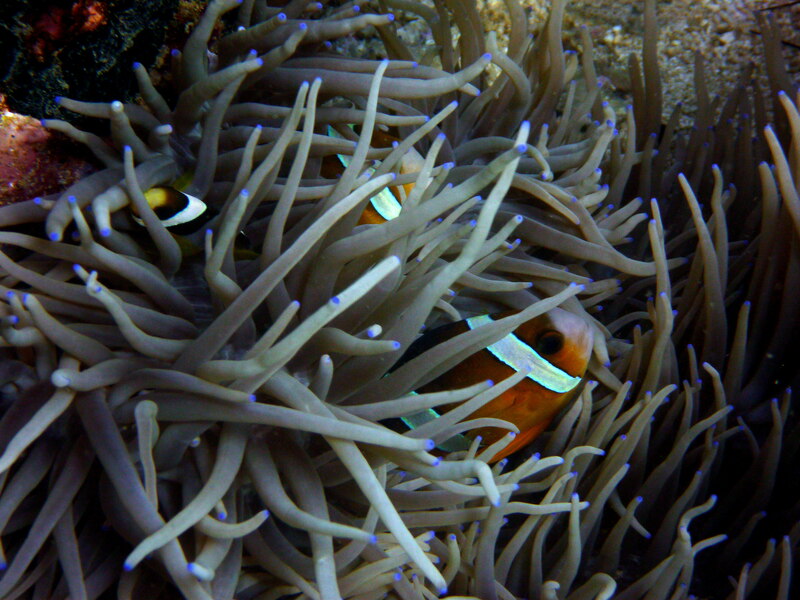 There were nudis, the clownfish that played hide & seek on anemones, anthias, angels, moorish idol, box fish and more. But I missed the resident moray eel, the stonefish and pygmy seahorse. 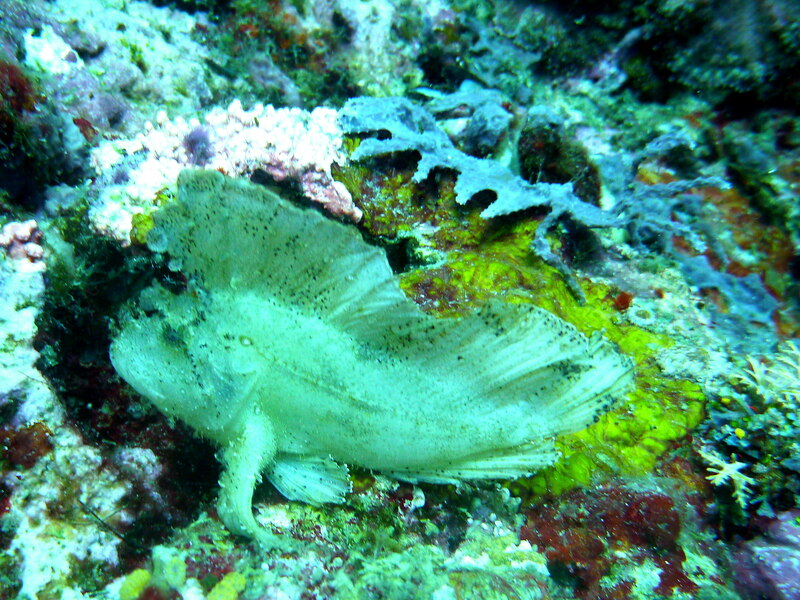 The leaf fish surprised us, I wasn’t expecting to meet her again, discreetly it was swaying with the current between the corals. 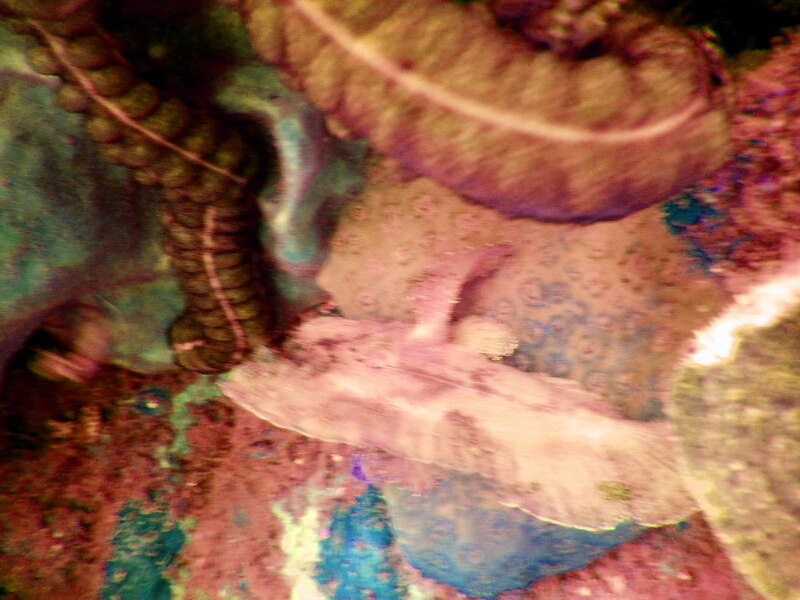 Our DM was too keen to notice this elusive specie, but we failed searching for macros in the soft corals. The currents could have swept them off. We ascend after 44 minutes at 32.3 meters as my deepest. Our surface interval was spent back at the resort dive shop, sitting and watching the horizons – blue waters, blue skies and Camiguin island afar! Finishing up our left over food (fish & chips with rice pop), sitting comfortably with afternoon breeze and the rustling leaves blown by the wind – was purely relaxing. MADRI is always home to me, the familiar surroundings gave me such comfort. There were no other guests, so it was like an exclusive dive for us! Both dives were in nitrox with no extra cost! Our DM suggested for Lapinig Island for our last descent, speeding our way almost 3pm to this lowly uninhabited island, the waters went choppy already. There was mild current as we descend on the sandy slope. We went around searching for macros but we found more trash, so it was some kind of clean-up which we always do as our commitment. There were sea fans, nudis, clownfish, anthias over corals, butterflies and more tropical fishes. 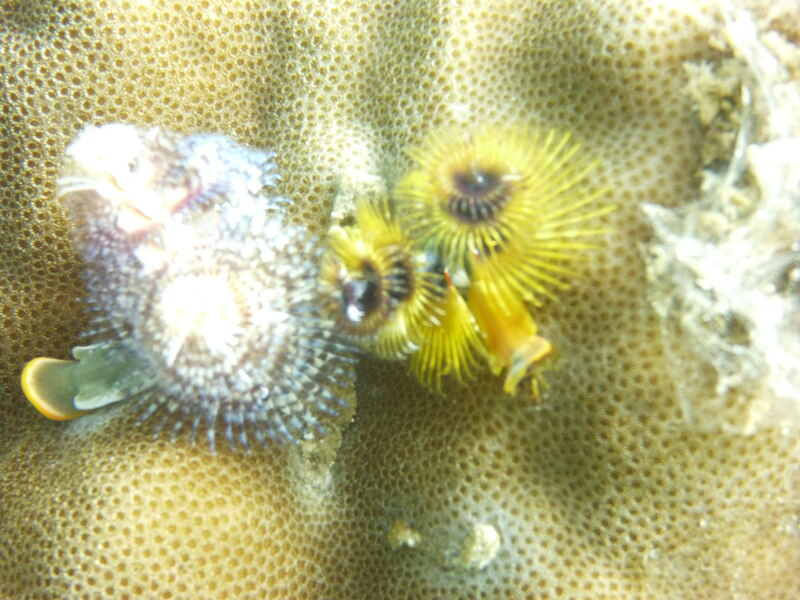 The spot is a ground of bristle worms, there were plenty of them embedded on the corals. We stayed over an hour going around feeling the warm afternoon waters, my deepest at 28.9 meters. Both dives were in enriched air with no extra cost! It was over two months from my last dive during the International Clean-Up Day, the two descents undoubtedly freshen up my dried-up gills! It was such bliss to be back in Mantangale, surely there will be next time to be home again. Silence… My own breathing… Bubbles. Holding on to a rope, descending, slowly. Nothing in sight, just waters and the sound of my breathing. There was only stillness as I went unto depths. Just few minutes back, there was turmoil on the surface and I was out of breath as I swam for the line. I was gasping, my mind racing just wanting to cancel my dive. 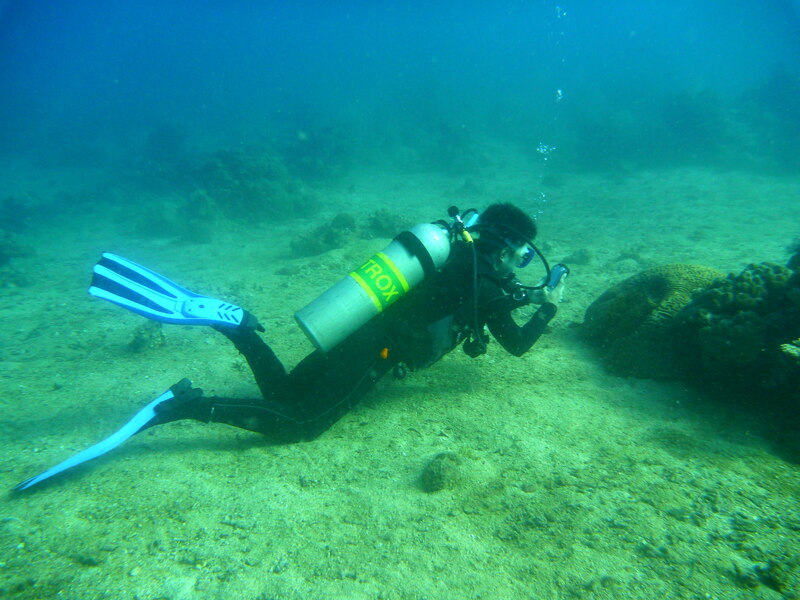 But my dive guide was firm and with controlled voice plainly told me to hold the line. Leaf fish at the shoal – new to me! black/white combi was new. 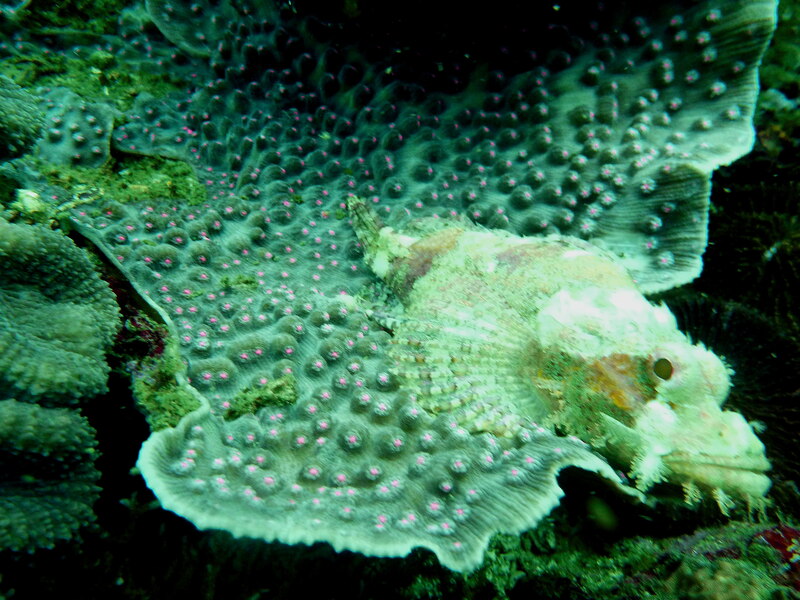 The resident scorpionfish still sitting on the coral top – just waiting for a prey. But I missed the big moray eel, he didn’t show up from his hole. I was wondering if he was just watching us from under the rocks. Lingered for more basking in the presence of the shoal’s residents but when my NDL got at four minutes, I signalled to the dive guide for the ascent after 51 minutes with air still at 80 bars. Speeding back to the resort, I was left alone by the staff after we agreed for the 1 pm second descent. The good thing was there was no other guests for the day, the place was all to myself totally. Silence… Sitting by the waterfront reading my book, the withered talisay leaves collected my feet as the noon winds blew under the trees. The grouper wanting to be fed! choose to stay nearby in a way observing us too. I was inching my way nearer but he was backing off inch by inch too maintaining its distance! Such magnificent animal. 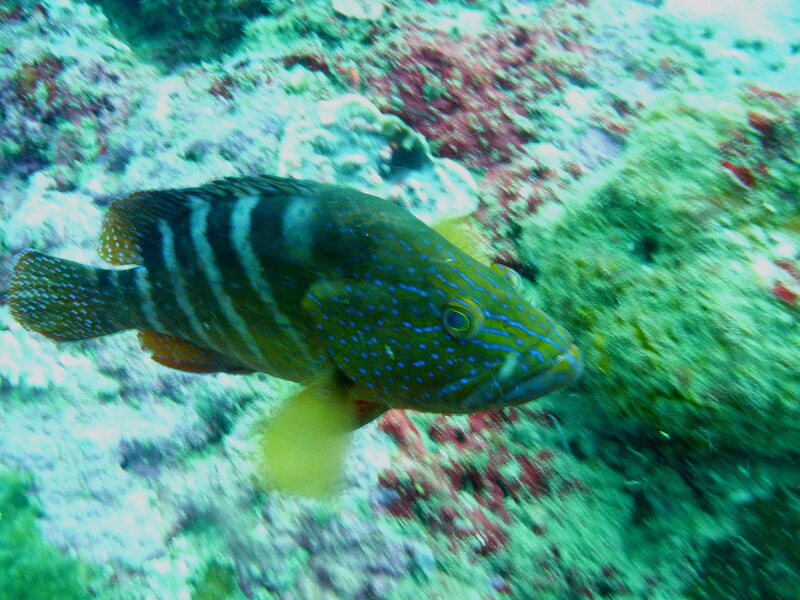 For awhile we float face to face, its fins wiggling around him as it swam backwards. I gathered a handful of trash as we went around, as every descent is a clean-up one. I needed keen eyes for this. The current has gotten stronger as we went shallower, I have to hold on to the coral rocks to maintain my depth during my safety stop – I was swept away up. We surface after 61 minutes with my air at 80 bars, the waves surging on and the waters fiercer. The cold sea air sweeping us and the salt water spraying us, as we sped off for the shores, watching the horizons in silence. It felt good. Coming home to MADRI and spending time in its nearby depths in silence is one best way to revive my sagging spirits and to brace me for the daunting year-end tasks. Just pure and natural silence. NB. Both dives were in EAN 30%. Banaug Shoal and Lapinig Island are indeed a paradise deep down, and always will be. 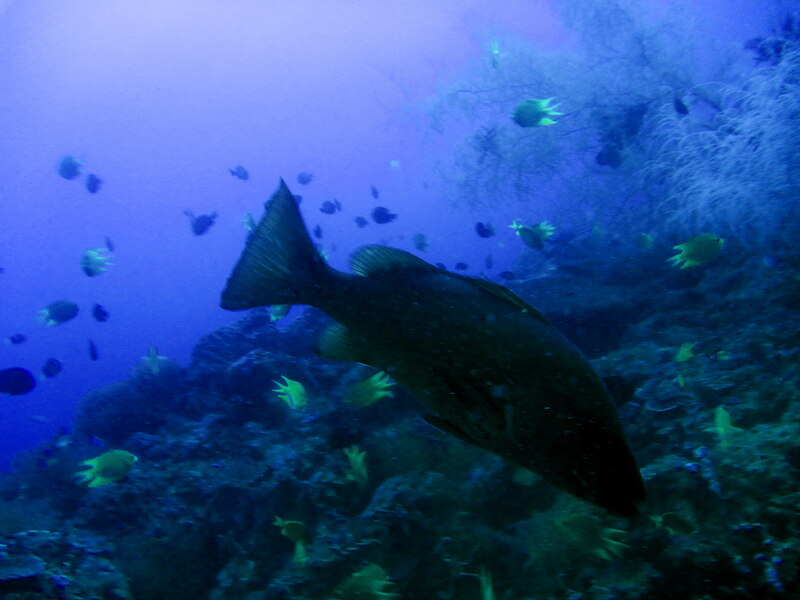 I had a rich encounter in my last dive with its residents, they always welcome my presence. I can always come back again and again, yet each time is always a new experience!